On Tuesday we had the pleasure of hosting Shari Caudron for the latest in our monthly series of Skypecasts / podcasts with authors who blog on TypePad. Shari is the author of Who Are You People, a Personal Journey into the Heart of Fanatical Passion in America, and blogs on TypePad at whoareyoupeople.typepad.com. Shari and I talked about everything from Barbie dolls to storm chasers to the Grobanites, as well as the combined power of blogs and MeetUp.com. If you missed the Skypecast, you can listen to our conversation here, or you can grab the 19mb file directly. This is our third TypePad podcast; if you're interested in subscribing to our amateur radio experiments in iTunes or another favorite audio player, you can grab an RSS feed of just our podcasts from our friends at Odeo. For each new subscriber you refer who stays with us for 90 days, we pay you $30. After the first ten subscribers you refer, we pay you a one time bonus of $100. Joining the program is easy; we use Commission Junction for tracking, reporting and (most importantly) paying our affiliates. If you don’t have a Commission Junction account, register today, if you do have one, search for "TypePad" inside CJ.com to learn more about the program. After our great conversations with Chris Anderson and Seth Godin about their new books, we decided it was time to make a home to show off all the great books that come from TypePad bloggers: books.typepad.com. It will collect biographical information, interviews and the podcasts we record all in one place. We also used Amazon's new aStore feature to put together a simple bookstore that makes it easy to browse and buy books by TypePad authors. For those who are interested in learning about each month's Featured TypePad Book, but don't want to have to keep checking the site, you can either subscribe to the site's feed, or sign up to receive a monthly email about the program. Just enter your preferred email address at books.typepad.com and we'll keep you in the loop. As for this month's featured author: We're really excited to talk with Shari Caudron, author of Who Are You People? , a look at fanatical obsession across the United States. (Bloggers, obsessed? Never.) Join us Tuesday, September 26th at 2:00 pm PDT for a Skypecast conversation with Shari. We'll be chatting about about pigeon racers, tornado chasers, Mayberry Days, furries, ice fishing, and diehard fans of Josh Groban. If you can't make, don't worry -- as always, we'll be posting a recording of our conversation as a podcast. 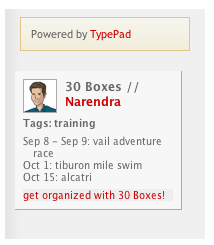 TypePad's been growing by leaps and bounds, and it's time for some housecleaning. This weekend between 10:00 pm PDT Saturday night and 2:00 am PDT Sunday morning we will be taking the TypePad application offline to perform routine database maintenance. During this time blogs will be available for reading, but you won't be able to log in to TypePad to manage your blog, and readers won't be able to leave comments or send TrackBacks. We'll be posting updates on Saturday night to status.sixapart.com, so tune in if you're interested. Thanks for your patience as we continue to grow and scale TypePad's operations! Update: We successfully completed our maintenance on Saturday night, and TypePad is back online. Since we launched the new "Home" tab inside TypePad, we've heard from many of you that the page was a good start, but that it could use a little work. Specifically, you told us that we should give more prominence to the tools that you use the most -- the QuickStart section that gives you easy access to your weblogs, TypeLists and Photo Albums. This afternoon we pushed a change to the Home tab that does exactly that. We've re-ordered things a bit, and moved the QuickStart module right to the top of the page, and shifted the other modules accordingly. Let us know what you think! One of the things we love about TypePad is just how many businesses -- large and small -- are using it to get the word out about their products, their people and their markets. We've seen so much interest in TypePad (and its sister product Movable Type) as a tool for business that we've created a series of Business Blogging Seminars around the country to discuss strategies, policies and best practices for business blogging. We'll be hitting different themes/industries in different cities around the U.S. this fall: our Washington DC event on September 28th will be focused on Politics & Advocacy, for example, while our Chicago event will be focused on Marketing, PR and Advertising. Visit our Business Blogging Seminar site for dates and details about how you can register to attend. We've added a bunch of new Widgets to the TypePad Widget Gallery recently, and we thought we'd share some of our favorites with you in case you've been too busy blogging to follow along. Interested in gathering some data from your readers? The Vizu Polls Widget makes it easy for you to add a simple questionnaire to the sidebar of your blog. You can use it to learn about your readers or learn from your readers, and with Vizu you can show off both the poll and its results in the same Widget. In addition to the Trumba Upcoming Events Widget we've blogged about before, we've recently added Widgets from 30 Boxes and Google Calendar. Even if you don't use one of these web-based services for your primary calendar, any one of them would be a great choice for sharing a list of your upcoming events, travel plans or other dates your readers might be interested in. One of our favorite new games around the office is blufr, a site from the folks behind Answers.com. Blufr is a free, addictive trivia game that challenges you to identify statements as true or false. They've turned the game into a Widget that you can place on your blog to bluff your readers. In addition to those new Widgets, our friends at del.icio.us and FeedBurner have added new Widgets to their offerings. The del.icio.us network badge is now a TypePad Widget, which allows you to display details about your del.icio.us network as part of your blog. And with FeedBurner's new Widget, you can now add an email subscription form to your blog with just a few clicks.